All stick and no carrot? How much diagnosis, but how much actual care, of dementia? The UK is hosting a G8 summit on dementia in London on 11 December. The summit aims to develop co-ordinated global action on dementia. 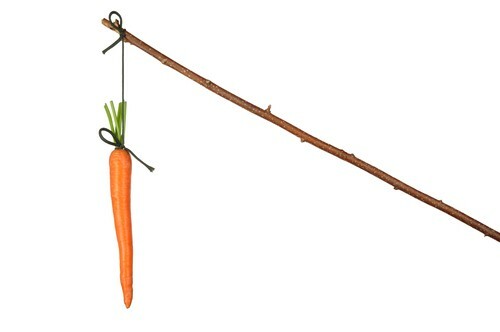 A “carrot and stick approach” is an idiom that refers to a policy of offering a combination of rewards and punishment to induce behaviour. It is named in reference to a cart driver dangling a carrot in front of a mule and holding a stick behind it. The mule would move towards the carrot because it wants the reward of food, while also moving away from the stick behind it, since it does not want the punishment of pain, thus drawing the cart. The “quality outcomes framework” has attracted a lot of criticism recently, in terms of GPs being incentivised to collect data relevant to ‘case finding’ new people with dementia. It has been widely criticised as a form of screening, which, for public health, physicians have found inadvisable. What is most worrying about the Alzheimer’s Society figures is the poor access to memory clinics in some areas: “The survey showed the average waiting time for an appointment is 32.5 working days, which is over 4-6 weeks (recommended by Memory Service National Accreditation Programme). Some memory clinics reported longer waiting times of up to 9 months. Unfortunately this result was ignored by the Health Secretary, who preferred to focus only on diagnosis rates, while blaming healthcare professionals for being unaware of the symptoms and nihilistic about treatment, claiming that: “Some even believe that without effective cure there’s no point putting people through the anxiety of a memory test – even though drugs can help stave off the condition for several years.” His statement about drugs affecting the course of the disease is completely unsupported by the evidence and contrary to both the WAR and WHO report. Alex’s article was even the more striking, as the article was in the context of his experience of his own mother. It was a very touching and moving account, which crystallised what is typical of beliefs, concerns and expectations of friends and relatives, including carers. What is important as a priority in English dementia policy is an issue which simply won’t go away, and, because of the sheer number of different stakeholders involved, it can hard to work out where this policy exactly is coming from. David Cameron answered two questions on #G8dementia (the G8 Dementia Summit) this afternoon in Prime Minister’s Questions. It is recorded in Hansard here. The first question was from Richard Fuller, Conservative MP for Bedford, enquiring about “real progress on dementia research and care”. Cameron decided to take as the focus of his answer his desire to improve dementia diagnosis rates. The answer did not address dementia care from the NHS. The second question was from Hazel Blears, who asked specifically about quality of care and prevention. The answer focused on ‘dementia friendly communities’, which is a global plank of policy but which is being serviced predominantly by the third sector seeking dominant positioning. That plank of policy is of course rightly to be applauded for its inclusivity and many other reasons. The answer did not, again however, address dementia care from the NHS. Big Pharma has not made great progress thus far in finding a cure for Alzheimer’s disease, a major form of dementia. However, their statement does not mentions of wellbeing in dementia care widely recognised by experts in this area. Whilst the therapeutic efficacy of drugs in early stages for improving memory in Alzheimer’s Disease, the most common form of dementia worldwide, is modest at best, most experts recognise the real progress in research into wellbeing as well as wellbeing interventions. These aspects include design of the ward, design of the house, attention to the external community (such as signage and paving), advocacy, careful attention to the person and personhood, assistive technology and other innovations. Dementia friendly communities, as an established worldwide initiative, are definitely important too. David Cameron’s answers will cause genuine concern amongst academics for the #G8 summit. These two questions were about the progress in research and quality of care: i.e. what happens to real patients on the ground, including what happens from the NHS. These two answers and certain presentations of the G8 summit represent however a potential corporatisation of the dementia debate, which many professional academics and clinicians in this area have been voicing concerns about for some time. It is just as well that bloggers who know the real difficulties involved, as well as actual people living with dementia, will be asked to contribute to the #G8dementia summit – and beyond – to provide balance.